Here's one of the coolest snowboarding ornaments customized for young ladies who enjoy racing or freestyling on the slopes, moguls or half-pipe! 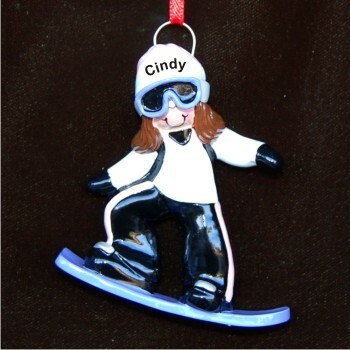 The brunette girl snowboard personalized Christmas ornament shows really sporty design and bright colors to add a splash to any tree. Some gals prefer to hang it from a backpack or gear bag like a charm. We'll add her name to the cap using a stylish font, and there's room on the reverse side for us to include a longer message from you. Tell her you like her style in the snow with the brunette snowboarding girl personalized Christmas ornament that arrives in our awesome velvet drawstring pouch.